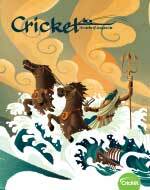 Come to the rescue, with Cricket. In this Cricket, a finch in a science classroom escapes her cage by paying attention to the teacher and learning to read. A grumpy old owl in a wildlife rescue center mentors injured baby owlets so they can be released back into the wild. In Greek mythology, the world’s greatest musician is rescued from drowning, and from pirates, by one of Poseidon’s dolphins. And Ida Lewis, a nineteenth-century lighthouse keeper, becomes famous for her daring rescues.